Our 72”, 180,000 BTU fixed-base model is the largest of our griddles and provides enough space to cook for a crowd. Easy rolling 8” wheels and 4” steering casters add to the great construction of our griddles. Take it to an off-site outdoor wedding or park it at a food festival, it will go anywhere you want to take it. Push to turn adjustable needle valves offer an element of safety. Coupled with cast iron air mixers, these valves allow the user to preset a maximum griddle temperature to maintain the surface seasoning during use. • 6 burner tubes rated at 30,000 BTU’s each and total BTU output of 180,000. • Total griddle weight as pictured is 260 lbs. • Shipment Dimensions: 84”L x 26”W x 39”H = 49.29 cubic feet, shipping is 300 lbs. • Ships via Common Carrier Freight (UPS Freight, XPO Logistics) tailgate delivery. For safety and convenience we only sell Worthington Cylinders that feature Overfill Protection Device valves. These tanks have both inner and outer threads to accept all standard POL & QCC fittings. Keep your grill clean and protect it from the weather. Our vinyl covers are made from commercial grade vinyl that is waterproof, tear-resistant, and rot-proof. UPGRADE your new unit to include a 10' hose. (Unit comes standard with 6' Hose) Available for new grill purchases only! UPGRADE your new unit to include a 12' hose. (Unit comes standard with 6' Hose) Available for new grill purchases only! UPGRADE your new unit to include a 15' hose. (Unit comes standard with 6' Hose) Available for new grill purchases only! We use ¼” thick steel to make our griddle tops. Each is manufactured from 1 solid piece of steel so the 4” side lip is bent and only welded at the corners where 2 pieces join. This makes for a more stable, reliable cooking surface that provides excellent heat transfer to the entire cooking surface. Each of our griddle plates is bolted to a carbon steel body and square-tube frame steel frame providing a sturdy base and protection during transportation. The carbon steel body can double as a warming/holding area for a prepared product. Two 8” heavy-duty wheels bolt onto our frame creating a strong foundation and power through rough terrain. Two 4” solid rubber locking casters enhance maneuverability. The casters 1-inch stem threads into the grill frame for creating unrivaled durability. Each 8” wheel has a capacity to carry 350 lbs. and each 4” caster has a capacity to carry 200 lbs. Therefore, the overall carrying capacity of the wheels used on each country club grill is 1,100 lbs. Under the steel griddle plate are 6 separate, wind resistant, steel burner tubes rated at 30,000 BTU’s each. Individually controlled burner tubes allow the surface temperature to be held uniform. All of our griddles are low pressure, but we choose to use a high-pressure hose with low-pressure fittings because they are much safer and can carry up to 125 PSI vs 1/2 PSI capacity. Our low-pressure regulator and QCC are rated for up to 200,000 BTU’s, plenty of power for our commercial equipment. Why settle for only what is necessary when we make them stronger? You will not be disappointed with the heat output of a Big John gas griddle. Six separate, wind resistant burners are rated at 30,000 BTU’s each (180,000 BTU’s total). Each burner is independently controlled giving the user the ability to set each to a different temperature or all to the same temperature. This is great for chefs who want to cook all at once or choose graduated heat for cooking in the front and holding in the back. 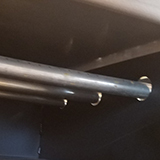 There is also a 6” section directly in the middle running front to back that is perfect for holding prepared food or warming butter as it is not directly over any heat source, only residual heat touches this section. Our ¼” thick steel griddle plate comes cured with vegetable oil and ready for use. The one-piece construction provides a solid workspace for cooking a wide variety of products. The 4” high lip on the sides and back give the user a piece of mind that product will not be lost and doubles as a windshield. The angled steel in the front routes the grease to 2 stainless steel drip trays located at either corner. Each griddle features three needle valves that completely eliminate the need to change valves when transitioning from using propane gas to natural gas. Simply adjust the valve to the right flow and start cooking. All of our grills are low pressure, but we choose to use a high-pressure hose with low-pressure fittings because they are much safer and can carry up to 125 PSI vs 1/2 PSI capacity. Our low-pressure regulator and QCC are rated for up to 200,000 BTU’s, plenty of power for our commercial equipment. This regulator can only be purchased from Big John Grills. 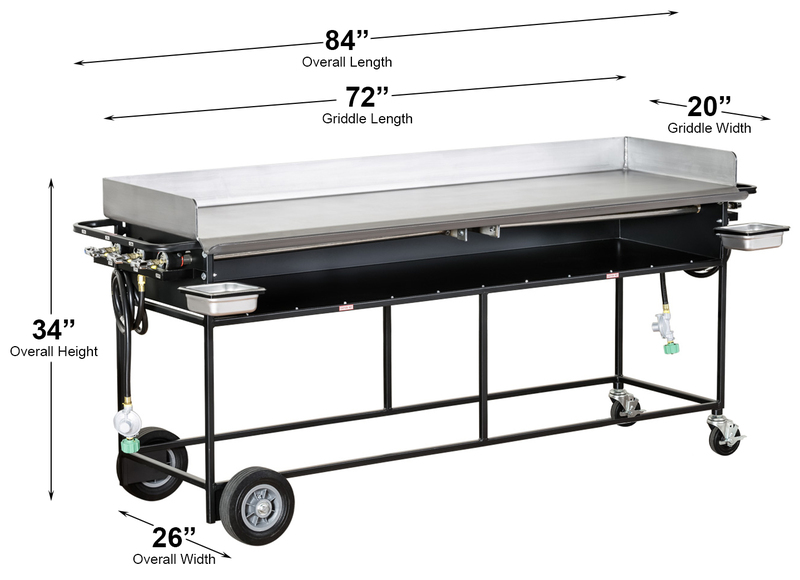 Under the steel griddle plate are 3 separate, wind resistant, stainless steel burner tubes with press-on air mixers for additional heat control. Individually controlled burner tubes allow the surface temperature to be held uniform.